Ah yes, the mid 1950's; everything is turning space age. Eisenhower is in office and other than worries about the Red Menace, the country is optimistic about the future and looking towards it. Designers are using what they see as the future in everything from toasters to automobiles. X-planes are breaking speed and altitude records and we are dreaming of men in space and trips to other planets and stars. These trips are common occurrences in a Los Angeles suburb called Hollywood, where movie producers and directors are cranking out space flicks at a rapid clip. Some of these movies are a bit much and have the usual collection of monsters and other horrible space aliens. Some of them are really good and the team uses these people called 'writers' to give us things called 'plots' and they have subjects that make us think. These movies are those titled 'War of the Worlds', 'When Worlds Collide', and 'Forbidden Planet'. These films all have cutting edge special effects that wowed the audiences of the day and are still very watchable even 50 plus years later. This is not the first C57D that has been produced by Polar Lights. About a decade or so back, they did a huge kit that, aside from the one at the Polar Lights table at the Nationals, I've never seen built. It is a daunting kit that suffers from what it has in common with other big kits; no where to put it. I've still got it and one of these days I may well give it a build. But for now, that is not required as Polar Lights has brought out a smaller version that looks to be much more buildable. Though the box does not show scale, I have been informed that it is 1/144. Even at this scale it has a 12" disc (that is with a C...), so still is fairly large. My visit to the LHS saw that they got in the de luxe version (said with some snobbery) and I knew I wanted it. Actually, the thing that makes it de luxe is that it has a PC board with lights in it that will probably not be with the standard kit. I missed out on my opportunity to buy one of these for a reasonable price on the bigger kit and perhaps that is why it is still on the shelf. As you can see from the photo, there are not a ton of parts. Not quite as featureless as Testors' 'salad bowl' Area 51 saucer, but pretty featureless. A goodly part of the construction will be spent assembling the stairs (which can be posed lowered or raised), and installing the lights. The system looks pretty simple and while the components are not what I'd call aircraft grade, should work fairly well. It appears that the lights spin because they are hooked to a motor, not due to any circuitry, which may be a better way to do it depending on the quality of the motor. 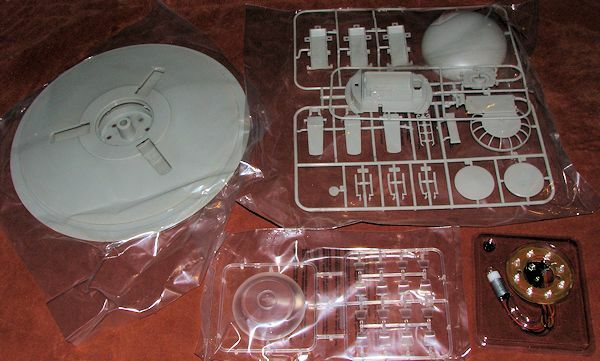 There is no interior and several clear bits for the top and the lower section of the saucer. One is advised not to paint the lower windows as the LEDs are red. The only other optional part is a landing post or one can model it 'in flight'. No stand is provided. Instructions are pretty simple and with a kit that has no more than a few dozen parts, I would have to say that most of the time will be spent painting it. Paint information is provided during the build. The saucer is basically two shades of silver as shown on the box art. No decals are provided though I do seem to recall that the C-57D did have a registration number on the saucer. I'll have to watch the movie again to determine that. If it does, it will be a simple matter for most of us to make some using our printers and clear decal paper. While I'm not as big a sci-fi geek as some, I do like to model movie ships and robots so have done a few of these from the classics over the years. Polar Lights kits are not inexpensive, but at least they have produced a number of subjects like this, and I'm quite pleased that they have. 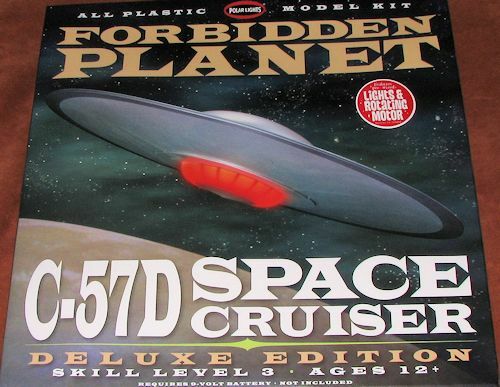 Forbidden Planet, watched probably hundreds of times over the last 40 years or so! Review kit courtesy of me and my quickly emptying pocketbook!